� Engle failed to advance from an AVP qualifier just once in her first four tries, but avenged the loss to the team that eliminated her by chalking up her first main draw victory against that team. 2012: Engle formed a new partnership with Tealle Hunkus, and the duo had finishes of fifth and sixth in the two AVP events. In those two tournaments they lost three matches, all to teams seeded fourth or better. Engle played in nine other domestic events and reached the semifinals three times; getting a second with both Hunkus and Emily Day and a third with Raquel Ferreira. Engle and Hunkus also played in one FIVB tournament, placing 17th in Seoul. 2011: Engle played 11 events on four different domestic tours, with a best of third with Snyder. She also had five fifth-place finishes, two with Snyder and three with Jessica Gysin. 2010: Played four AVP events with Jennifer Snyder, getting a best of ninth in their first tournament together. 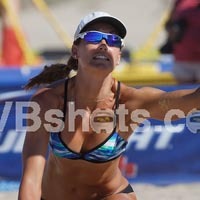 2009: Played with three different partners on the AVP, making the main draw in each event except for her second outing. Made her international debut in Finland with Cayley Thurlby, as they were selected as USAV's No. 1 U-26 beach team in July. College: Formerly Christal Morrison, she was an outside hitter at Washington where she became the first four-time AVCA All-American in school history. Additionally, she was the first Husky to be named first-team All-Pac 10 all four years. She left the school as the career leader in kills and points, third in aces, seventh in digs, and 10th in total blocks. In 2005 she lead the team to its first national title, and was named the NCAA Championship Most Outstanding Player. UW advanced to the national semifinals in three of her four seasons. Personal: Engle, who has two older brothers, lettered in both volleyball and track in high school. She was chosen as the 2003 Washington state Gatorade Player of the Year.